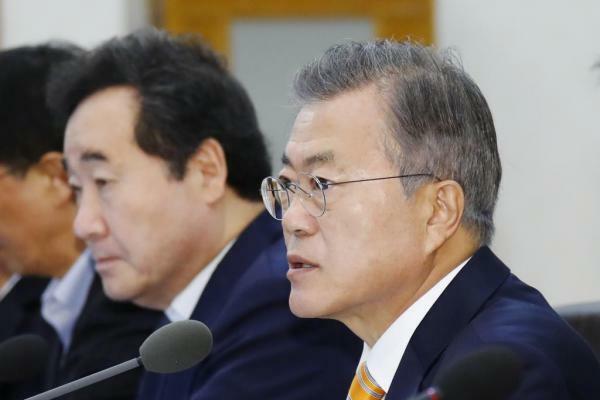 SEOUL, Oct. 23 (UPI) — The South Korean government ratified Tuesday the inter-Korean agreements signed at the North-South Korea summit in Pyongyang last month. South Korean President Moon Jae-in signed and ratified the Pyongyang Declaration and the military agreement at a cabinet meeting on Tuesday. The two agreements were signed with North Korean leader Kim Jong Un at the September summit in Pyongyang. “This will help rid the country of risks and protect the people’s lives and safety. Moreover, it will benefit the residents living on the border areas,” Moon said at the cabinet meeting. The government earlier pursued a parliamentary ratification for the agreements. However, the Ministry of Government Legislation concluded that the agreements do not need a parliamentary approval. The major ruling party, where Moon is a member, welcomed the decision to ratify the two agreements. “This makes it clear for our role at the National Assembly. We should ratify the Panmunjom Declaration, pending right now due to the opposition by the Liberty Korea Party, as soon as possible,” the Democratic Party of Korea said Tuesday. However, the major opposition Liberty Korea Party criticized Moon. ‘This is an abuse of the ministry of government legislation’s review on the matter and an act that disregards the National Assembly,” Kim Sung-tae, floor leader of the Liberty Korea Party, told reporters, according to Yonhap News. The Panmunjom Declaration, signed at the first summit between South and North Korean leaders in April, was submitted to the National Assembly for ratification but has been pending due to oppositions by the major opposition party. The presidential office said that the Panmunjom Declaration needs a parliamentary ratification as the agreement would require a consent from lawmakers for a future budget use for its implementation.